Who do “we” anthropologists think “we” are? And how do forms and notions of collective disciplinary identity shape the way we think, write, and do anthropology? This volume explores how the anthropological “we” has been construed, transformed, and deployed across history and the global anthropological landscape. 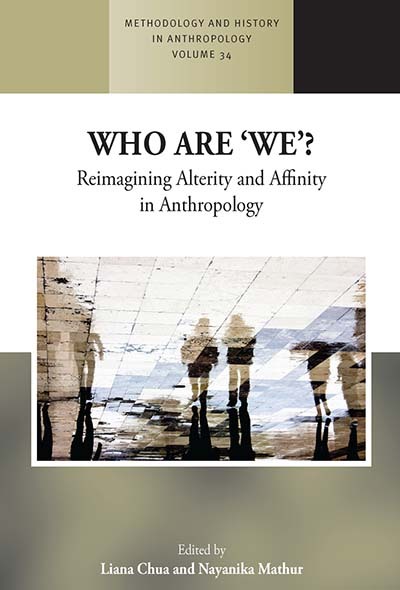 Drawing together both reflections and ethnographic case studies, it interrogates the critical—yet poorly studied—roles played by myriad anthropological “we” ss in generating and influencing anthropological theory, method, and analysis. In the process, new spaces are opened for reimagining who “we” are – and what “we,” and indeed anthropology, could become. Liana Chua is Senior Lecturer in Anthropology at Brunel University London. She works on Christianity, ethnic politics, resettlement, and development in Borneo, and on global orangutan conservation in “the Anthropocene.” Her publications include The Christianity of Culture (Palgrave, 2012) and co-edited volumes on evidence, power in Southeast Asia, and Alfred Gell’s theory of art. Nayanika Mathur is Associate Professor in the Anthropology of South Asia and Fellow of Wolfson College at the University of Oxford. She is currently working on multispecies ethnography, climate change, and human-big cat conflict in the Anthropocene. She is the author of Paper Tiger: Law, Bureaucracy and the Developmental State in Himalayan India (Cambridge, 2016) and the co-editor of Remaking the Public Good: A New Anthropology of Bureaucracy (Cambridge Journal of Anthropology, 2015). PART III: WHERE DO 'WE' GO FROM HERE?